This easy homemade Caffè Mocha is a perfect drink to start your day with. It has the aroma and intensity of Vietnamese coffee, combined with a chocolatey flavor. Homemade Coffee is the Best! This Caffè Mocha (or Mocha Coffee) is what we came up with after being disappointed with the mocha served at local coffee shops. We recently started to make coffee at home more frequently. The main reason is we love to be able to customize it to our liking. And so we have been coming up with different coffee variants for our daily caffeine dose. 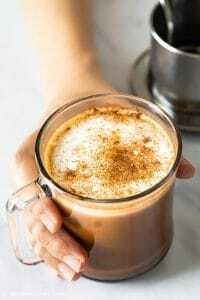 This mocha coffee is delicious, quick and easy to make as well as highly customizable. What is this Caffè Mocha with Vietnamese Coffee? Regular mocha is a coffee beverage made with espresso, hot milk and usually cocoa powder. I think the definition of how a delicious cup of mocha should taste is subjective. To us, it should still have a strong coffee aroma and the chocolate flavor shouldn’t be too intrusive. The taste of milk shouldn’t overwhelm the coffee and chocolate flavors. Lastly, the drink shouldn’t be too sweet. In fact, we like our mocha to have some bitterness. Our caffè mocha recipe uses Vietnamese coffee instead of espresso. Vietnamese coffee by itself is strong and aromatic with a nutty and chocolate fragrance since it contains Robusta. Therefore it goes very well with cocoa powder and hot milk, resulting in a perfect cup of mocha for us. You will need Vietnamese ground coffee, cocoa powder, hot milk, and sweetened condensed milk to make this drink. I also dust it with some cinnamon powder for a cozy feeling when drinking it :). Our favorite coffee choice is Trung Nguyen Legendee Creative 8, which is more expensive than other regular Trung Nguyen coffee blends, but it also tastes so much better. You can buy Trung Nguyen coffee online from Amazon or lenscoffee.com or at Asian grocery stores. I have never bought from lenscoffee.com but they have positives reviews on their website. Vietnamese families in the US also use Cafe du Monde to brew Vietnamese coffee. Making this version of caffè mocha requires brewing Vietnamese coffee, so you will need a phin coffee filter. You can find it at Asian grocery stores or on Amazon. To heat the milk and create foam, I use a Bialetti electric milk frother. It is easy to use and clean, heat milk and create froth in a few seconds. The bad part about it is it can froth only a fairly small amount of milk each time, around 1/3-1/2 cup. More than that, you will have milk spilled all over the place. There are also other brands that make electric milk frothers as well as battery handheld milk frothers. If you don’t have a milk frother, it’s okay to heat the milk on the stovetop and whisk vigorously to create foam. 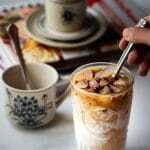 To make this mocha coffee, first, add condensed milk and cocoa powder to a serving glass. Mix to combine. 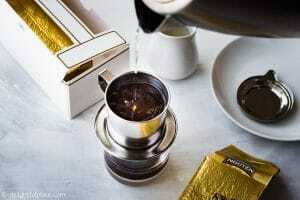 Then place the coffee phin filter on the glass and brew Vietnamese coffee directly into it. 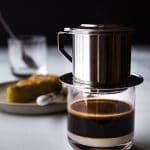 My Vietnamese coffee post has detailed step-by-step photos, video and instructions for brewing Vietnamese coffee. 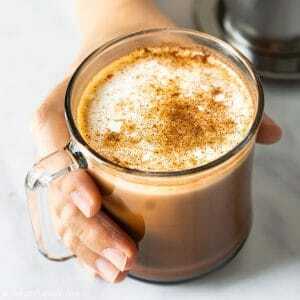 Finally, you just pour steamed milk into the glass, dust with some cinnamon or cocoa powder and enjoy! I’d love to hear what you think about this dish, so please feel free to leave a comment. New recipes are added every week so let’s connect on Facebook, Pinterest and Instagram for the latest updates. You can find my collection of Vietnamese recipes here. This homemade Caffè Mocha is a perfect drink to start your day. It has the aroma and intensity of Vietnamese coffee, combined with a chocolatey flavor. It is easy and quick to make at home and highly customizable. In the glass you are going to brew the coffee into, add sweetened condensed milk and cocoa powder. Stir to combine. Add Vietnamese ground coffee to the phin filter chamber and place the filter press on top, press gently. Place the filter over the glass and then add 1 tablespoon of hot water wait for about 10-20 seconds to let the ground coffee swell and settle. Add the remaining hot water and cover the chamber with the filter cap. Let the coffee liquid drip into the glass. This may take a few minutes. You can adjust the dripping speed by pressing the filter press. If the coffee drips too quickly, press the filter press a little more to slow it down. 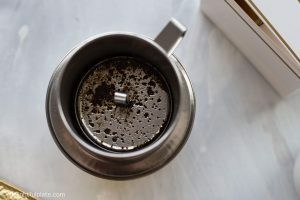 If you need more detailed instructions with step-by-step photos to brew Vietnamese coffee, visit the link in the recipe notes down below. 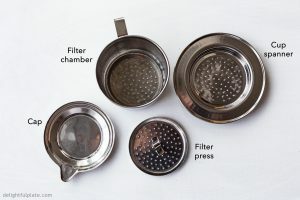 Once the filter chamber is empty, remove the filter from the glass. Stir to combine the coffee with the cocoa powder-condensed milk mixture. Add steamed milk to the glass. 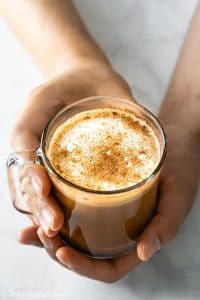 You can use a milk frother to heat the milk and create froth, or gently heat it on the stovetop and whisk vigorously to create foam (do not let the milk boil). Dust the mocha with some cinnamon powder (optional) and enjoy. For more detailed instructions with step-by-step photos to brew Vietnamese coffee, check out my Vietnamese coffee recipe post. It is easy to customize this caffè mocha to your liking. if you want a stronger coffee taste, add 1 extra teaspoon of Vietnamese ground coffee. you can also add more milk (up to 1/2 cup of steamed milk in total) if you want the drink to be less strong. add more or less sweetened condensed milk to make the drink more or less sweet. you can also top the mocha with whipped cream. Disclosure: Delightful Plate is a participant in the Amazon Services LLC Associates Program, an affiliate advertising program designed to provide a means for sites to earn advertising fees by advertising and linking to Amazon.com. As an Amazon associate, we earn from qualifying purchases at no extra cost to you. We only recommend products we use and trust. Notify me of followup comments via e-mail. You can also subscribe to our newsletter without commenting. Sign up and receive updates with free recipes via email once a month.